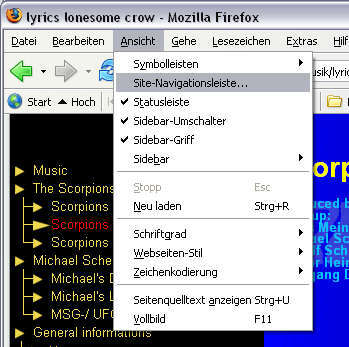 The Site Navigation Toolbar is an extension for Mozilla Firefox. 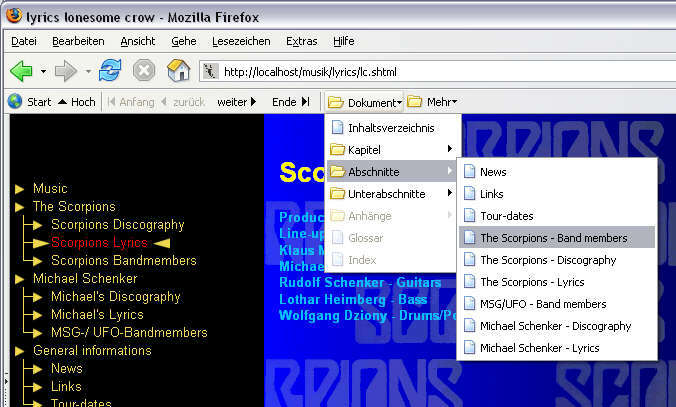 It displays the related web pages of the current page in a toolbar in a similar way like Mozilla Suite or SeaMonkey do. However, constucting the toolbar, Site Navigation Toolbar makes not only use of the rel-attributes of the link-element, but also of its rev-attribute and the attributes of the a-element. Supports of LINK information from meta tags with attributes http-equiv="Link"
The rel attribute now accepts blank separated list of values, however only the first value is handled. Conflicts with the short-cut-keys are resolved. 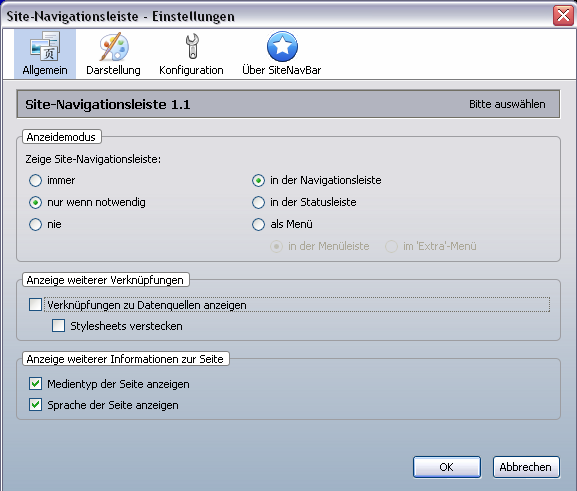 Users who had hidden the Sitenavigationbar will be notified, if pages support the site navigation. support of rev="bookmark" in HTML anchor elements not containing a href attribute. The URI will be build from the id- or name-attribute. The statusbar is now fully customizable. Toolbar elements can be shown as symbols or text only as well as a combination of both. statusbar elements are shown as symbols only, to save space. Links from frames are now be registered (only second level). 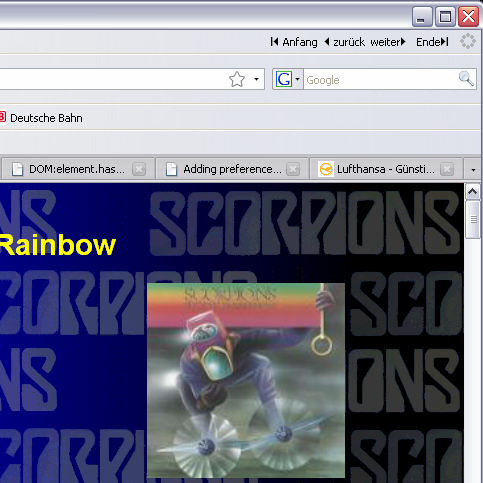 Older Versions show links from the top-level frameset only. The target attribute is now supported. Possible values: "_blank", "win", "tab", "tabshifted", "save" and "current" ("_self" and "_parent" are treated as "current"). Other Values are treated as frame name. An Opera-like style has been added. Target- and MIME-Type-attribute can be displayed. The "onclick"-event is now supported on the "link"-element. NavBar-elements are now accessible by short-cut-keys. Styles and positions can be changed by pop-up menus or short-cut-keys, without invoking the pref-window. The elements in the statusbar are now customizable. Version 1.1 did not display the 'bookmark'-links, this bug is fixed now. Support for German language added. On the right side you can select how the toolbar is displayed: either in the toolbox (as in mozilla suite) or in the statusbar or as a menu in the menubar. meta - Refers to a document that provides metadata, for instance in RDF, about the document. icon - Refers to a resource that represents an icon for the document. p3pv1 - Refers to a P3P Policy Reference File. profile - Refers to a document that defines relationships or provides metadata, for instance in RDF, about the document. 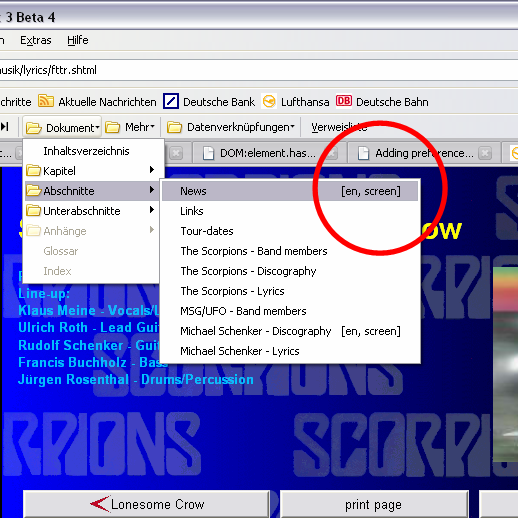 Selecting the checkboxes Show Lingua or Show Media enables SITENAVBAR to show the language of the selected page or the media the page had been made for. support of rev= bookmark in HTML anchor elements not containing a href attribute. The URI will be build from the id- or name-attribute. The target attribute is now supported. Possible values: _blank , win , tab , tabshifted , save and current ( _self and _parent are treated as current ). Other Values are treated as frame name. The onclick -event is now supported on the link -element.